News & Education / Six great places to buy a winter home in the U.S.
What's your idea of the perfect winter escape? Do you want to trade your boots and down jacket for flip-flops and shorts or would you rather pack up your skis and snowboards and head for the slopes? Do you want to own a place by a beach or at the base of a mountain? We've chosen six great destinations in the U.S. to buy a winter vacation home – three for those who like it sunny and warm and three for those who love the snow. And in case you like the idea of renting your home out when you're not there, many of these destinations have lots to offer all year round. Why: This barrier island in South Florida is just seven miles long and one and a half miles wide. Ron Schmedley, who lives in Cincinnati and bought a vacation house there in 2007, says Anna Maria Island is, "the perfect place to escape the hustle and bustle of our busy lives and rest our toes in the sand. The island is what 'Old Florida' used to be. There is an ordinance that no structure can be built higher than the tallest palm trees, so you don't have the huge high-rise condos dotting the beach, just the crystal clear water. Numerous restaurants offer seafood right off fishermen's boats. Just talking about this now makes me long for a trip down there." When Schmedley and his family visit, they spend most of their time at the beach, where, he says, "it's not surprising to see manatee, dolphin, stingrays and plenty of other wildlife while we're looking out at the water." What's Available Now: According to Zillow, the average home value for a single-family home is $913,4000. Homes range in price from $649,900 o just under $5 million. A three bedroom, three bath waterfront home with lush landscaping and a pool is listed for $1.295 million. Why: Beaufort (pronounced Byew-fort, not to be confused with Beaufort, North Carolina, pronounced Bow-fort) is a great destination for anyone looking for a temperate climate during the winter. Located in South Carolina Lowcountry, "our winters are very mild and allow for plenty of outdoor recreation – inshore fishing is popular as are trips to the nearby beaches, golf, biking and tennis," says Edward Dukes, a lifelong resident and managing partner in Lowcountry Real Estate. Beaufort, chartered in 1711, sits on the Intracoastal Waterway between Charleston and Savannah, each just a short drive away. Hunting Island, 15 miles from town, offers an "amazing beach, bike paths and a canal for kayaking, paddle-boarding and fishing," says Dukes. He recommends buying a vacation house right in the town, which is rich with history and Lowcountry architecture and culture and an easy walk to dinner, shopping and the University of South Carolina's Performing Arts Center. You can also buy properties in nearby gated golf and beach communities and, if you like boating, you can buy in a neighborhood with a community dock. What's Available Now: Homes in Beaufort range in price from $70,000 to $3.5 million, according to Zillow. A 2,600-square-foot, three-story home upper and lower screen porches built in 1967 is listed for $765,000. The average home value for Beaufort is $200,800. Why: Encompassing Scottsdale, Paradise Valley and Mesa, the Phoenix area makes outdoor living in the middle of winter easy and fun with lots of sunshine, little rain and mild temperatures. Combine golfing, hiking, tennis, biking and swimming with visits to the Phoenix Art Museum or the Heard Museum dedicated American Indian art and history or to a performance by the Phoenix Symphony, Ballet Arizona or the Arizona Opera. Phoenix was hit hard during the housing crisis, and while prices are normalizing, they are still well below the peak. According to Troy Reeves, owner of The Reeves Team, "Wile housing prices have had growth at a slightly faster than average pace over the last few years, it is mainly fueled by the fact that prices previously were too low and we have been catching up to where we need to be all along." What's Available Now: There are almost 5,000 homes to choose from in the Phoenix area, with an average home value of $211,300. A four bedroom, three bath home built in 1999 with a loft and fireplace and 3,215 square feet of living space is listed at $400,000. The property includes a pool. Why: Jackson Hole Mountain Resort took first place in Ski Magazine's list of top ski resorts in 2014 and the magazine continues to heap praise on the town. But downhill skiing is only one choice for getting outside: You can cross-country ski on groomed tracks or into the national parks and forests, snowmobile around nearby Yellowstone National Park, take a sleigh ride through the National Elk Refuge, dogsled, helicopter ski, snowshoe and ice-skate. Since 97% of Jackson Hole's land is permanently protected from development, properties on the remaining 3% are pretty scarce. As a result, dollar volume and transactions are extremely high. Kelli Ward, an associate broker at Jackson Hole Sotheby's International Realty, says that "Wyoming is one of the friendliest states in the U.S. for people relocating for the purposes of…trusts and overall asset protection." But, "that is just a bonus to some who want to be in Jackson Hole for the beauty of the land." That is apparent as soon as you fly into the area airport: It is the only airport in the U.S. located in a national park, and passengers get a look at "huge views or the Tetons, which are absolutely breathtaking" even before their plane has landed, Ward says. What's Available Now: The average home value in Jackson Hole is $1,572,500. A slopeside condo in Teton Village with just under 1,600 square feet and two bedrooms and three baths has a $1.29 million price tag; it is near the south entrance to Grand Teton National Park and has a solid rental performance. 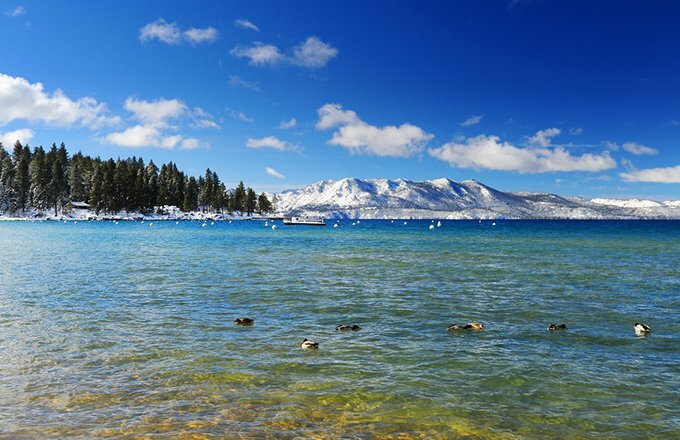 Why: Lake Tahoe is huge – 71 miles around – with ski areas on its north end (in Nevada) and its south end (in California). The South Shore is the livelier of the two, according to Dan Spano, who went there to ski 30 years ago and never left. According to Spano, owner of Paradise Real Estate, the south end is also somewhat more affordable. The median home sales price in Lake Tahoe is $737,500, while the south side is $502,500. If you want a lakefront home on either side, be prepared to pay $3 million to $25 million. "People are attracted to Lake Tahoe because it's one of the most beautiful places on earth and the winters are mild compared to resorts in the eastern part of the U.S.," says Spano. At the Heavenly Mountain Resort area, you can ski two states in one day and enjoy what Spano says is the best snow-making equipment in the area. Right now the real estate market in Tahoe is "very strong," according to Spano: "San Francisco Bay area residents doing well financially are buying second or even third homes before prices go out of sight." What's Available Now: A 2,846 square foot home located in a private cul-de-sac with vacant land surrounding it and four bedrooms and three baths is listed for $898,989. It's close to skiing, shopping and casinos. Why: Okemo routinely tops the list of OnTheSnow.com's "Best Family Resort in America" so if you're looking for a family vacation destination, this might be it. According to Bonnie MacPherson, director of public relations at the resort, Okemo get this top rating because the family who owns the operation understands that "families are looking for activities they can enjoy together on and off the slopes." Take Tim and Diane Mueller who bought a home at Okemo Mountain Resort in 1982 for themselves and their two kids. They still spend their winter vacation there but now their grandchildren come along, too. The resort boasts "options for every level, available from the top of each chair" with 46 miles of trails, 667 skiable acres and, thanks to snowmaking equipment that covers 98% of the mountain, a "weatherproof" ski vacation. Okemo is a three-hour drive from Boston and just under five hours from New York City. What's Available Now: SouthFace Village at Okemo offers luxury townhomes, single family homes and chalets as well as building lots. A slopeside townhome with just over 1,800 square feet and three bedrooms plus loft and three baths is listed for $1,053,000. Whether you like to escape the snow or have fun in it, there are many great destinations to find the perfect winter home. This article was written by Marjorie A. Cohen from Investopedia Stock Analysis and was legally licensed through the NewsCred publisher network. Please direct all licensing questions to legal@newscred.com.